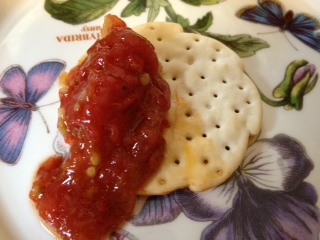 My friend Marian was over for dinner the other night; she saw all my tomatoes and suggested I make tomato confit. Okay, so I had never had tomato confit. So she told me how to make it and that I would then want to spread it on anything and everything. She was right! Just look at that! Yum city! I had a lot of very ripe tomatoes, so I made it the next morning. After I tasted the first batch, I made 2 more batches! Since I did not have the time to do canning, I have frozen most of it in small batches for use in pasta dishes, to enhance sauces, or just to dip my crackers into! Brie! Oh yes, serve it with brie. Ahhh. I do not know if I am making a perfectly correct confit, but it is delicious nonetheless. Pour about 1/4 inch of oil into a square r rectangular pan. 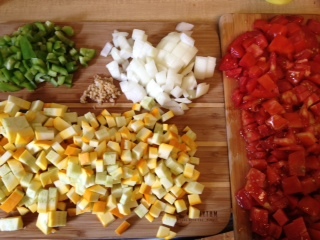 Place the tomatoes in, cut side down. 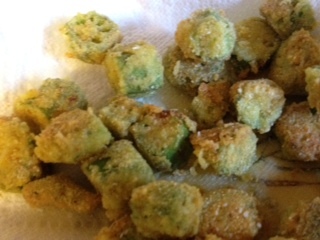 Add garlic and sprinkle with salt and pepper. (The picture below is of the 3rd batch, so I had fewer tomatoes, the other two batches were crammed with tomatoes taking up every inch. You can’t see all the garlic, most of it is under the oil. 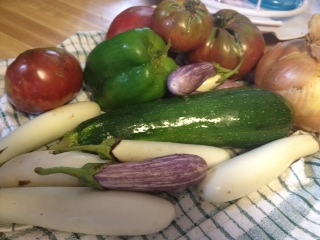 And those are ripe green zebra tomatoes, not unripe tomatoes). Let cool. 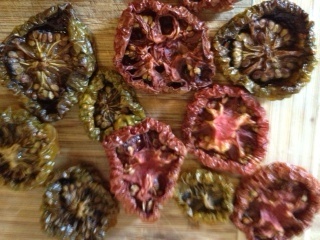 Peel off the skins and move the tomatoes to a bowl. Go ahead, dip in that cracker and enjoy! 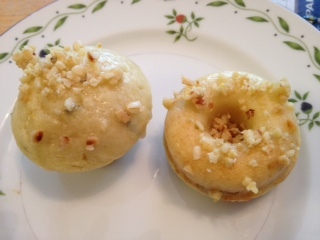 Flying to California this spring, I found a recipe for Rosemary ‘Fonuts’ in the airline magazine “Spirit”. A savory donut…I was going to have to try it. But as I was baking, Arielle tasted the batter and said “This would go well with a vanilla glaze”. So our combo of savory and sweet was created. I would make the glaze thicker next time, just to make them prettier, but this is a definite keeper! Their recipe said it made 12 mini donuts, but we had way more batter than that, so it made 12 mini donuts and 12 mini muffins. Mini donuts are cute, but I think I would do them all as mini muffins next time. Preheat the oven to 350F. Coat the donut and muffin tins with spray oil. 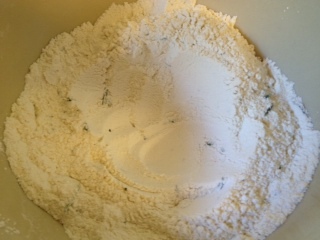 Mix the flour, sugar, baking powder, salt and rosemary in a large bowl. Make a well in the center. 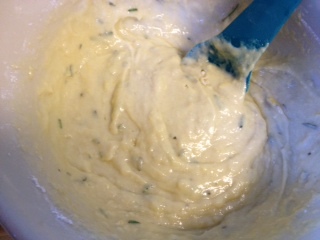 In another bowl, mix the milk, oils, eggs, lemon zest and lemon juice. 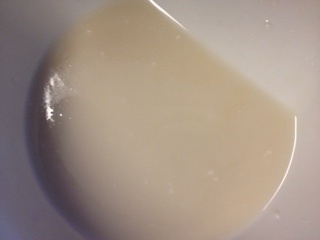 Pour the liquid into the well and stir until the batter is mixed but still lumpy. Pour the batter into the donut and muffin tins. 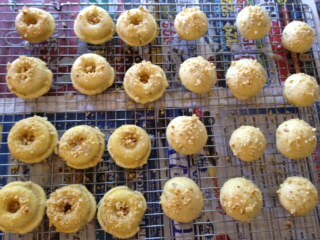 Bake the donuts for 12 minutes, the muffins for about 15, til a toothpick inserted into the center comes out clean. 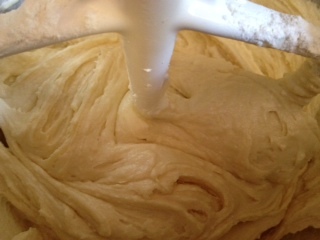 While the donuts/muffin are baking prepare the topping and glaze. 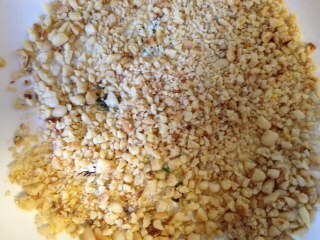 For the topping, finely chop the pine nuts and combine with a little salt (to taste). 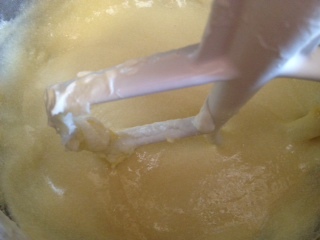 For the glaze: whisk together the confectioners sugar, water and vanilla. 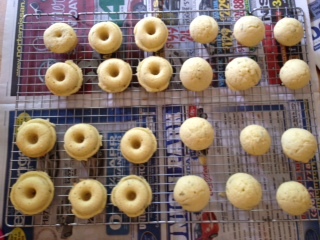 When the donuts/muffins are done, remove them to a cooling rack. 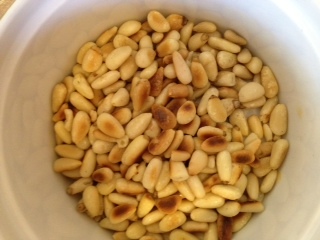 Dip them in glaze and sprinkle on the pine nut topping. Enjoy! Makes 24 mini donuts and/or muffins. 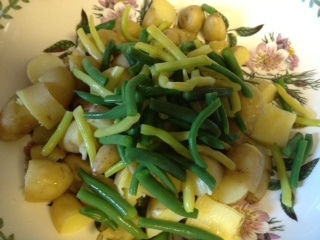 Pasta, potatoes, green beans – sounds heavy, eh? 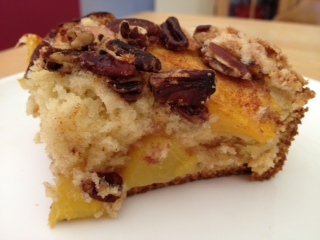 When I first saw Martha Rose Shulman’s recipe combining the three, I was skeptical. 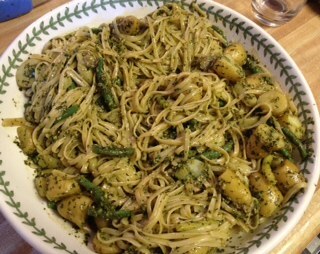 But since I always have pesto and, in late summer, lots of green beans, I though I would try it. To everyone’s surprise, the combination was wonderful. Very homey and hearty. It has become a staple in our house for the last 4 years or so. 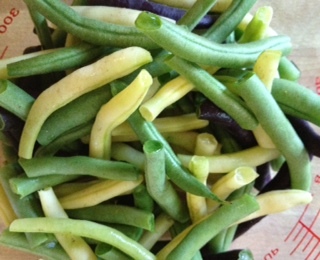 This recipe is an adaptation, based on our abundance of green beans and my pesto recipe. This makes a lot, feeds 6 with large portions or 8 with smaller portions. It is great that it makes a lot because it takes just as good cold the next day! 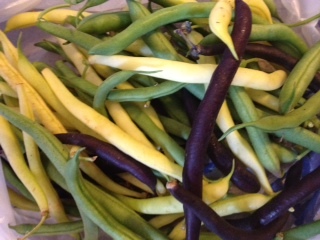 Trim the green beans and break into about 1″ pieces. Set aside. 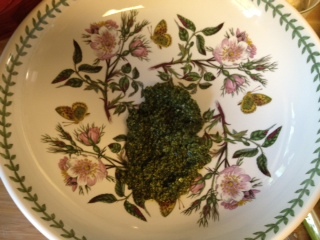 Place the pesto in a large serving bowl. 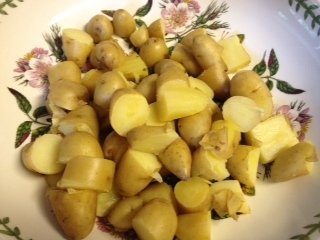 In a saucepan, place potatoes and cover with water. Add some salt. 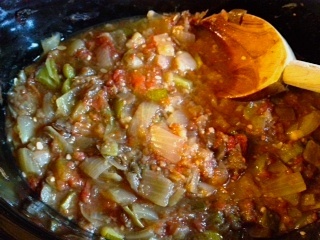 Heat to boiling, partially cover and cook until fork tender – about 20 minutes. 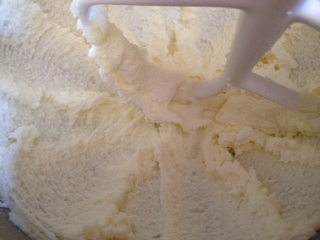 Remove and let cool a little. 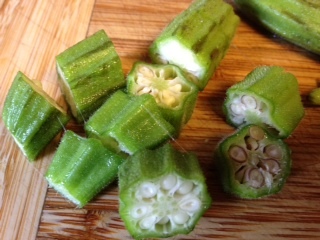 Cut into large bite-sized pieces. 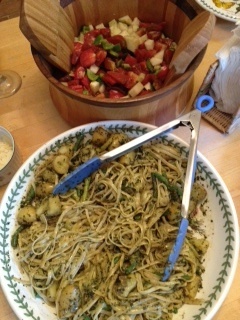 and place in bowl with the pesto. Heat a large pot of salted water to boiling. Prepare a bowl of ice water. 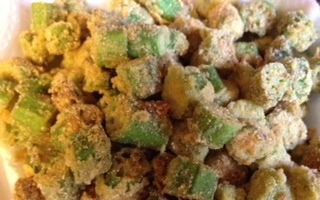 Add green beans and cook for 4 minutes. Remove with a spider and plunge into ice water. 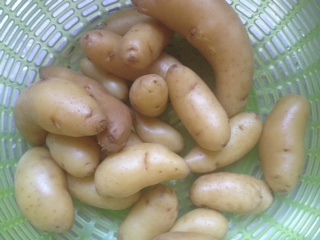 Drain and add to bowl with potatoes and pesto. 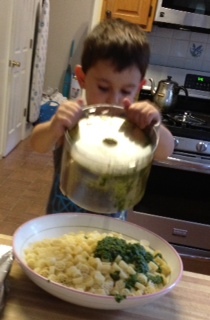 Bring the pot of water back to boiling and add pasta. Cook according to package directions. Drain and add to the pesto bowl. Toss to combine. 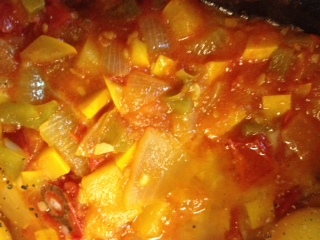 Add 1/2 cup of the pasta water if more liquid is needed. 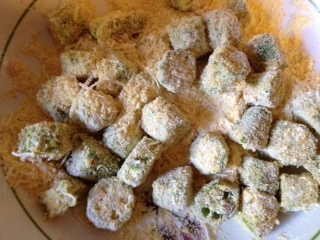 Serve with grated cheese to pass. We also like it with a tomato-cucumber salad (see post). Enjoy! 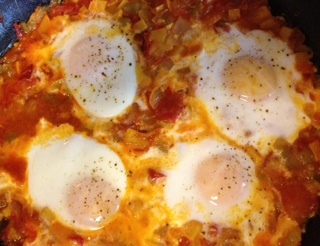 I love the recipe for pan-cooked zucchini & tomatoes with eggs in Martha Rose Shulman’s Mediterranean Harvest cookbook. 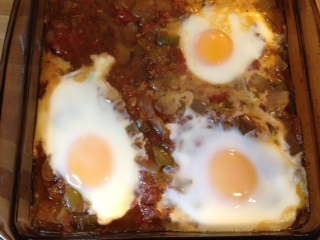 It is a ratatouille-like dish, to which eggs are placed on top and then baked. I can’t describe how good this tastes! 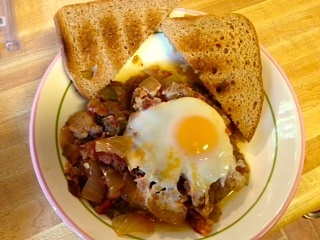 Here I have done 2 versions of it, one fairly close to her recipe, using summer squash instead of zucchini, the other being my slow cooker interpretation, using a mixture of zucchini and eggplant (since I did not have enough zucchini in the house). Both came out delicious and show a range and mix of ingredients that can be used based on what you have available. As you can see, both are beautiful color combinations! 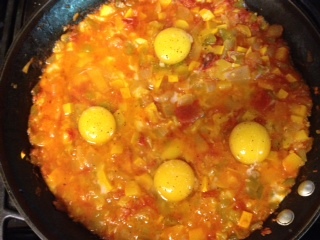 Heat the oil in a large, oven-proof non-stick skillet over medium heat. 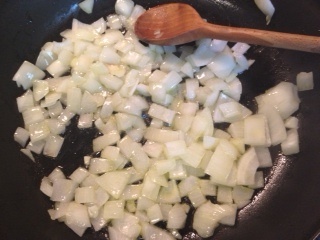 Add onions and cook, stirring til just tender, about 5 minutes. 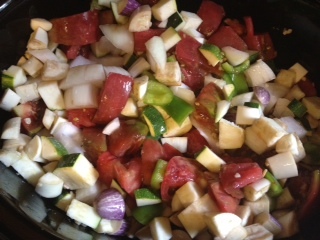 Add the bell pepper and cook another 5 minutes, until the vegetables are softening. 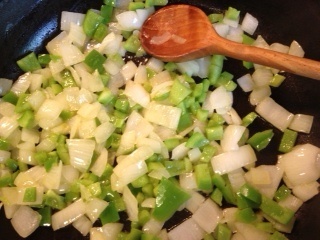 Add the garlic and cook a minute or two, until fragrant. Add the zucchini/squash and toss together for a couple of minutes until coated with oil and beginning to look translucent. 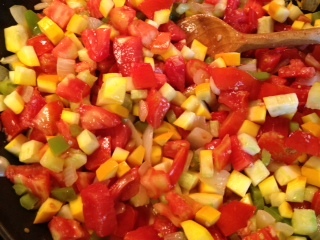 Add the tomatoes, sugar, and a generous amount of salt. 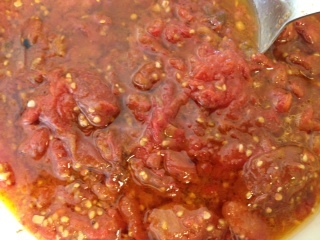 Increase the heat to medium-high and cook, stirring often, for 5-10 minutes, until the tomatoes have cooked down slightly. 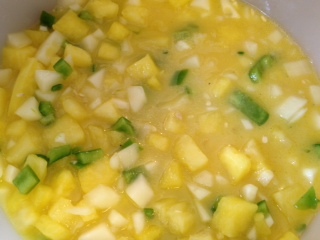 Add the water, stir, and reduce heat to medium. 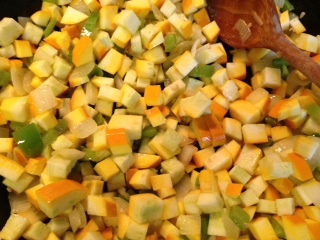 Cook, uncovered, for 30-35 minutes, stirring oftern and pressing down on the zucchini with the back of a spoon, until the vegetables are soft and easy to mash. 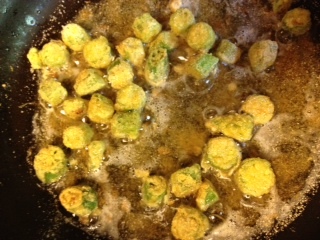 Keep pressing so that the dish thickens and the zucchini breaks down a bit. Taste, adjust seasoning and add the pepper. Using the back of a spoon, make indents and add the eggs in the indents. Serve hot or warm with a hearty bread or toast. Enjoy! 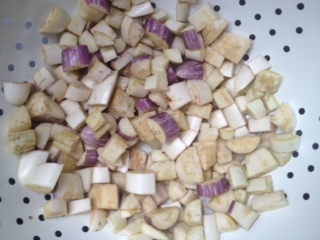 If using eggplant – Place eggplant in a colander, sprinkle with kosher salt. Let stand for 15-20 minutes, then rinse and drain. 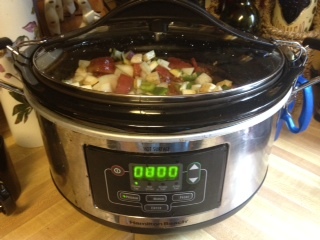 Place all ingredients in the slow cooker, stir to mix well. Set the cooker to low for 8 hours. At the end of 8 hours, preheat the oven to 400F. Open the lid and check the moisture level. 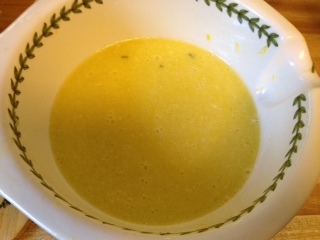 If there is still too much moisture, set on high – leave uncovered – and cook, stirring occasionally until the dish thickens up. Taste and adjust seasoning as needed. Spoon into an 8″ square pan. Using the back of a spoon, make indents and add the eggs in the indents. Use a spatula to serve. Serve with a hearty bread or toast. Enjoy! By now, you should be aware of how much we like pesto. 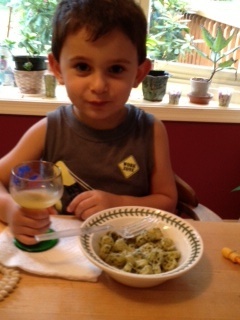 So, to make sure he always can have pesto to eat, it was time for our “Top Chef” Cammy to make his own. His was just like mine, minus the pine nuts. 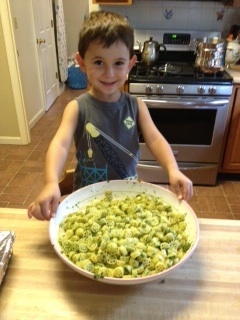 For the recipe, see my Pesto post. The only problem with his being called the “Top Chef” is that he has decided that I am to be called the “Bottom Chef”. 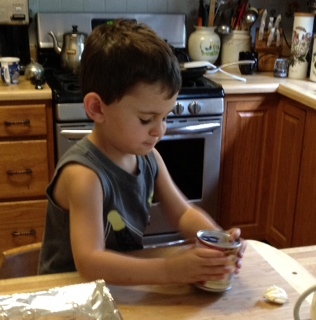 I have tried to convince him to at least call me his sous chef, but noooo, “Bottom Chef” it is. And he loves to use it. 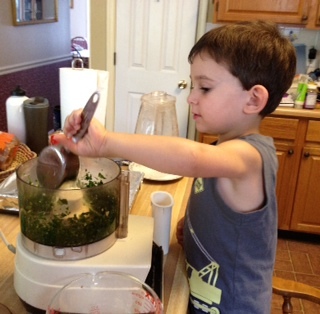 At each step of the pesto, I heard “Bottom Chef, what comes next?” We used the pictorial directions from Mollie Katzen’s Pretend Soup, so he then typically followed up by telling me what was next. 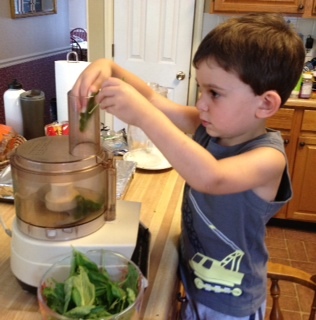 So, first things first, we went out to the garden and picked some basil. 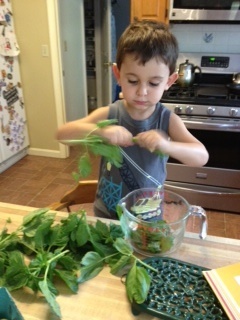 His task was the pick the leaves off the stems. Then smash and peel the garlic. 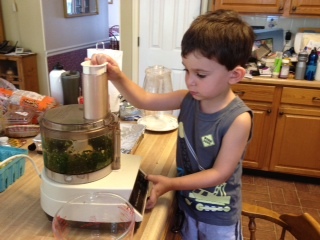 He loved that he got to use the food processor for this recipe. 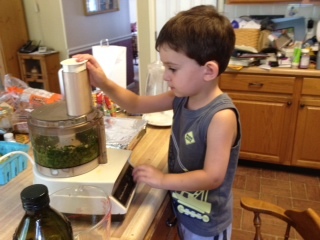 It is probably his favorite kitchen appliance. 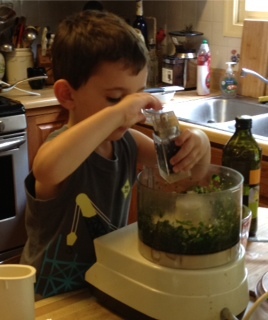 Then pulse again til the pesto is the consistency you like. When I find myself with more tomatoes than counter-space to store them on, I have several options (in addition to sharing them with friends): make sauce, freeze them, or make sun-dried tomatoes. 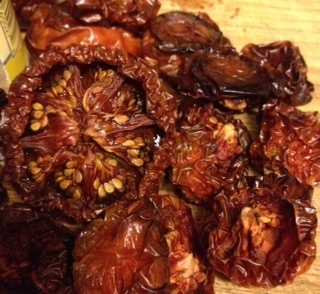 Sun-dried tomatoes are one of my favorite foods, many never make it from the oven into the jars (any ‘imperfection’ is a good excuse for me to eat it immediately). I store them in pretty little jars that I enjoy using and also make great gifts throughout the year. 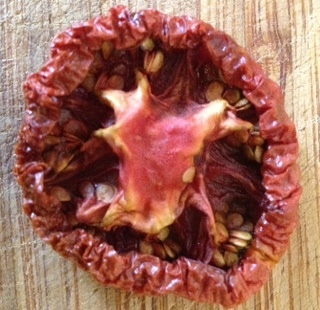 Any tomato will work for drying. 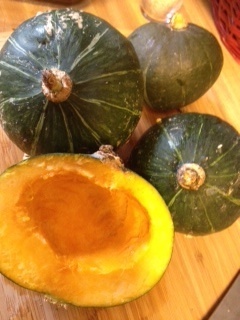 Small ones can be cut in half, large ones in quarters – make sure you place them skin down on the baking tray. The process takes a l-o-n-g time, so only do this when you will be around for a full day. I often find that I have not-quite-done ones that have to sit in the oven (with the heat off) overnight until I wake up and can finish drying them out. 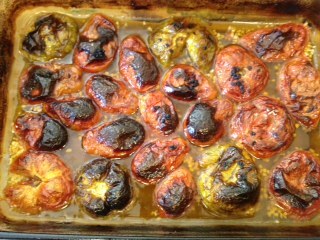 I would not suggest leaving the oven on overnight, you don’t want to put all that time in only to over-dry the tomatoes. 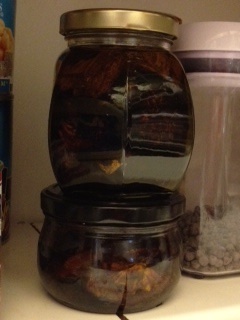 I store the jars of tomatoes in oil in the pantry. Once I open one, I keep it in the fridge. 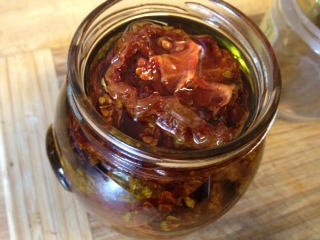 The oil will solidify, but that is ok.
An added treat – the oil left over in the jars after you use the tomatoes can be use for cooking as an infused oil – yum! Heat the oven to between 170 and 200F. Line a baking tray with aluminum foil. 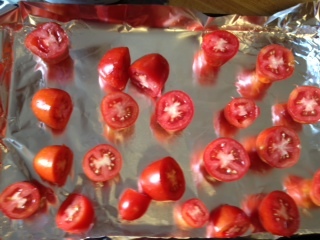 Place the cut tomatoes skin-side down on the foil. 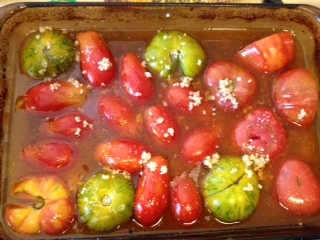 Place the tray in the oven and let the tomatoes dry out for hours. 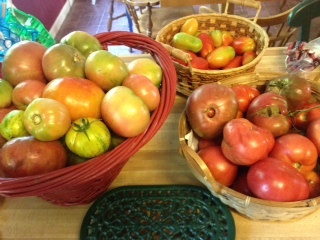 The time will vary depending upon how much moisture is in the tomatoes and how big the pieces are. I usually plan on at least 8 hours, but it can be more. 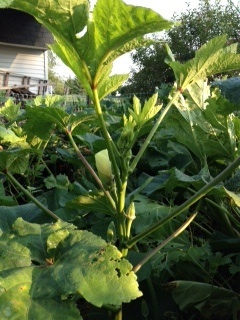 Just check them every hour or so after that to see how they are progressing. 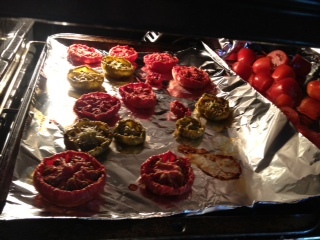 Once the tomatoes are dried, remove from oven and cool. Store in jars, fill the far with olive oil. Enjoy! 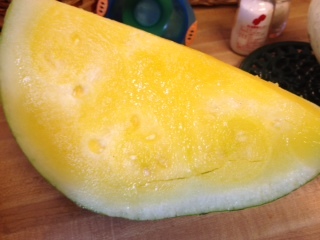 I stopped at Filasky’s Produce again to pick up corn and fruit and they had their yellow seedless watermelons ready – yum! 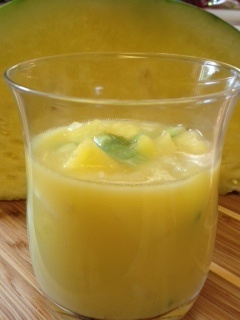 My friend Kelly O’Neill had sent me her watermelon gazpacho recipe earlier in the summer and it was delicious, so I decided I had to make it with the yellow watermelon. 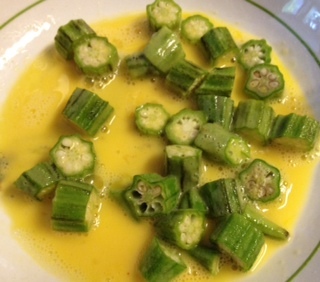 For color contrast, I used a green pepper instead of the yellow bell, but I would suggest sticking with a yellow or orange pepper, they are a bit sweeter. This gazpacho is wonderfully refreshing, with just the right mix of sweet and bite. Great for the hot days of August. Refrigerate for at least half an hour before serving. Enjoy! 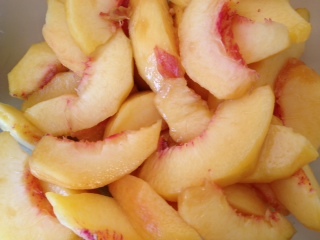 August is peaches. Did you know that Delaware is known for its peaches? 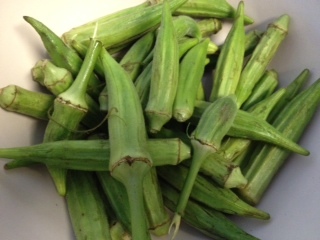 The ones used here were grown just 5 miles from my house at Fifer Orchards. 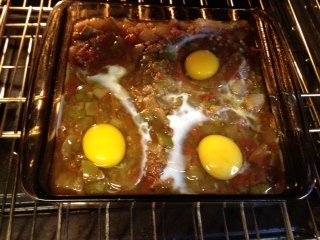 And of course, it wouldn’t be one of my baked goods if it did not have Farmer Kim’s eggs. This recipe is Ina Garten’s, from the Food Network’s website. 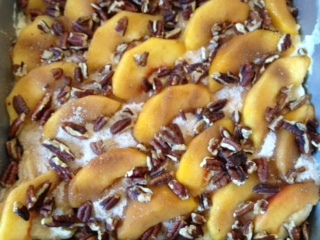 It uses sour cream in the batter, and tops the cake with chopped pecans along with the peaches. Yum! 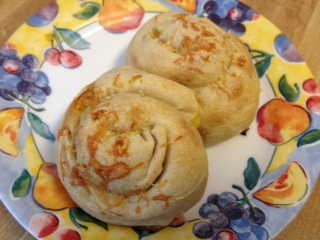 Again, since I did not change her recipe at all, I am linking to it, so if the pictures below entice you to make it, just click HERE for the recipe. Bake and enjoy! 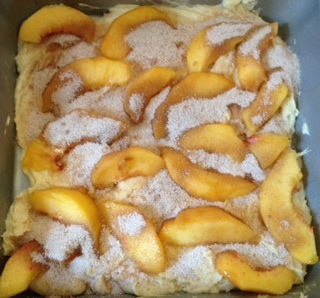 Peach cake right before being eaten!